The Accelerando Arts Break features interviews with Accelerando students Aalia Hanif and Cedric Quinn, Nashville Symphony music director Giancarlo Guerrero, and yours truly. We believe that classical music is vital in the 21st century, but in order to remain relevant, we have to insure that the orchestras reflect the diversity in the community. So that is the reason why we started this program: it makes an investment in the future and (in) creating the next generations of young musicians from very diverse backgrounds. This goes to the long-term health of our art form. The world is made up of people from different backgrounds, different ethnicities. So by having people feel that they ‘have room’ in this completely different world of classical music, I think expands the audience, and orchestras, and makes sure that classical music also represents the world that we live in today. 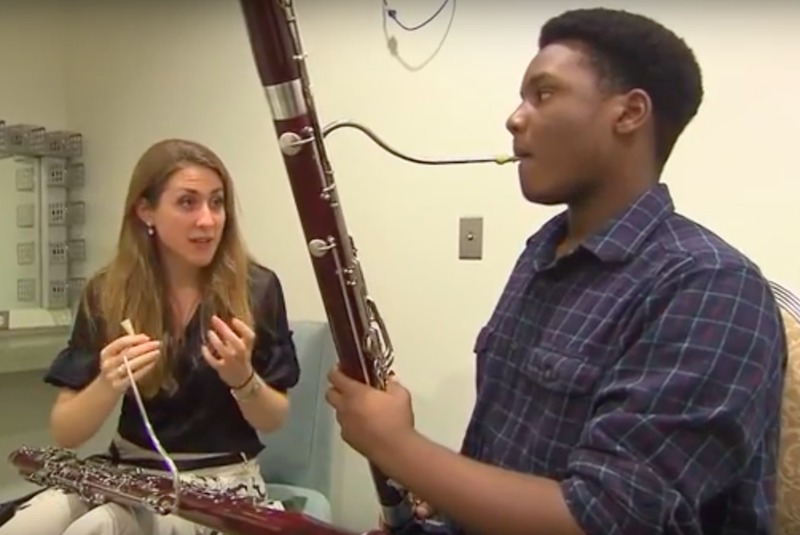 The short video also includes footage of Nashville Symphony Principal Bassoon Julia Harguindey teaching Cedric a bassoon lesson, Giancarlo conducting a Nashville Symphony performance, and candid footage from a reception held for our inaugural Accelerando class and their families in August. By walterbitner in Accelerando, Education, Music Education, Nashville Symphony Programs on October 7, 2016 .